Q Is the CACI Non-Surgical Facelift painful? Not at all, the CACI Microcurrent works in tune with the body’s own bio-field. Some clients may experience tingling within the skin, a metallic taste in the mouth and small spots of flashing in the eyes. Not everyone will experience these but if you do be assured that they are completely harmless and safe. It is simply the current flowing through the saliva which causes these experiences. Q What age can you start to have these treatments? The microcurrent treatments are very beneficial to slow down the ageing process, keeping the muscles and skin tighter and plumper. The recommended age to start having these treatments as a preventative treatment is 25-30 years of age. As a corrective treatment to lift and re-educate the muscles, minimising lines and wrinkles, it is recommended to receive treatment between 40-80 years of age. Our range of CACI treatments are suitable for most people over the age of 18 years. Q Can anyone receive CACI treatments? Q If I take antidepressants will it affect my treatments? We strongly suggest that you tell your therapist if you are taking antidepressants as these can affect the results of your treatments. Q I am currently taking medication for acne, can you treat me? You must have stopped taking Retin A for at least 3-6 months before starting any treatments that uses a microcurrent. If you are taking Roaccutane, you must have stopped taking it for 12-18 months prior to the treatments being carried out. Please note that all contraindications will be discussed during your consultation. Some contraindications will require your doctor’s permission before treatments can commence. Q Can I receive CACI treatments even if I have sensitive skin? Most clients with sensitive skin can have CACI treatments without any problems as all the treatments can be adapted to suit your skin. Q Do I need maintenance following my course of Non-Surgical Facelift treatments? This is entirely up to you; however we do advise that following your course of treatments you keep up with the required maintenance every 4-6 weeks to retain lasting results. Q What are ETR pads? ETR pads are made from rubber, metal and silicone so it’s important you tell us if you have an allergy to any one of these. These small sticky pads are placed on and around the face and neck during the Non-surgical Facelift and some of our other treatments. ETR is an abbreviation of Enhanced Tissue Repair using which is very beneficial for blemishes, lines, wrinkles, scars, burns and stretch marks. The CACI Crystal Free Orbital Microdermabrasion is designed to treat all skin types including clients with sensitive skin. 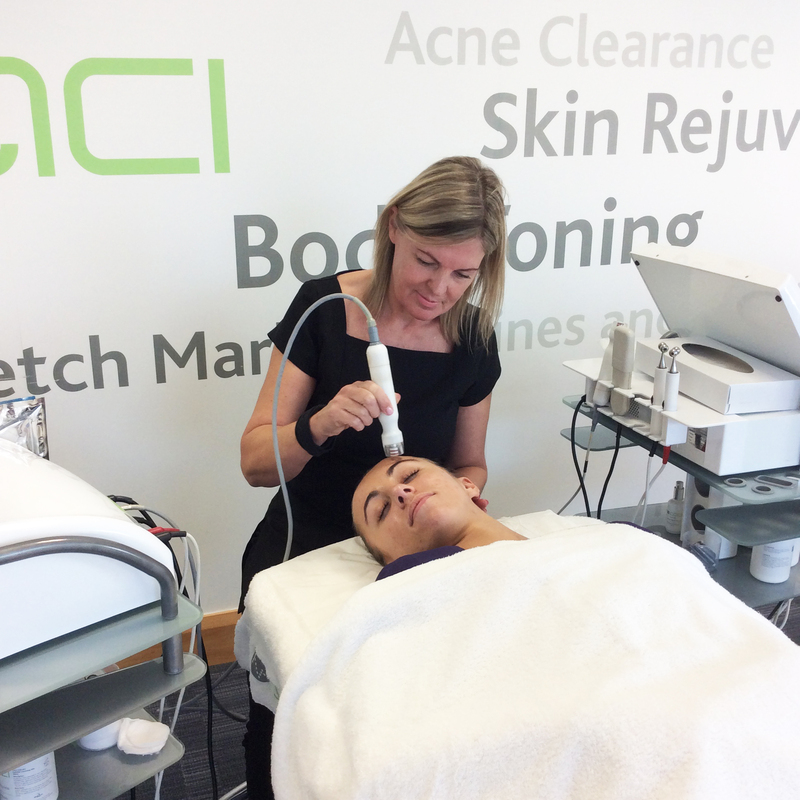 Q Does the CACI Wrinkle Comb hurt? The sensation can feel tingly and warm. We do however incorporate an Amino Lift Peptide Cream that reduces the sensation quite significantly, resulting in a more comfortable experience. Q Can you treat pigmentation, stretch marks and scarring? Yes through combinations of microdermabrasion and Red and Blue LED Light Therapy. It is usually recommended that you have a course of treatments to achieve optimum results. Q Can you treat any medical conditions?